Since our last post/flip, we've gotten a lot of questions about teak wood. Mainly how to identify and restore teak wood. 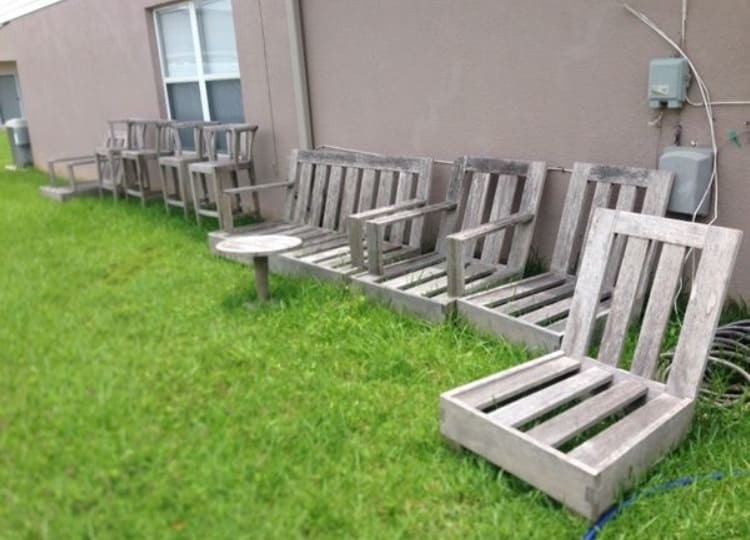 I am sure it has sparked an interest in many because the ROI on this teak patio set was 2,500%! We spent $100 on a set of 4 chairs, a love seat, 4 bar stools and a table that we found on Offer Up. That probably sounds so low for all of that furniture, but check out the condition it was in when I went to go look at it. It was not much to look at, and looked like it was rotten wood on it's last life. But once I saw this listing I wondered if it was teak wood, so I had to check it out. Why did it matter if it was teak or not? Because teak wood is basically a weather-proof wood. Water doesn't hurt and damage it like it does other wood over time, and for that reason it's used in a lot of boats. I am a boat guy, which is how I was familiar with this wood. I knew I could restore the set nicely if it was indeed teak, and when I got there – it was! There are several things that sets teak wood apart from other kinds of wood. Two of the biggest identifiers are how dense it is and how heavy it is. 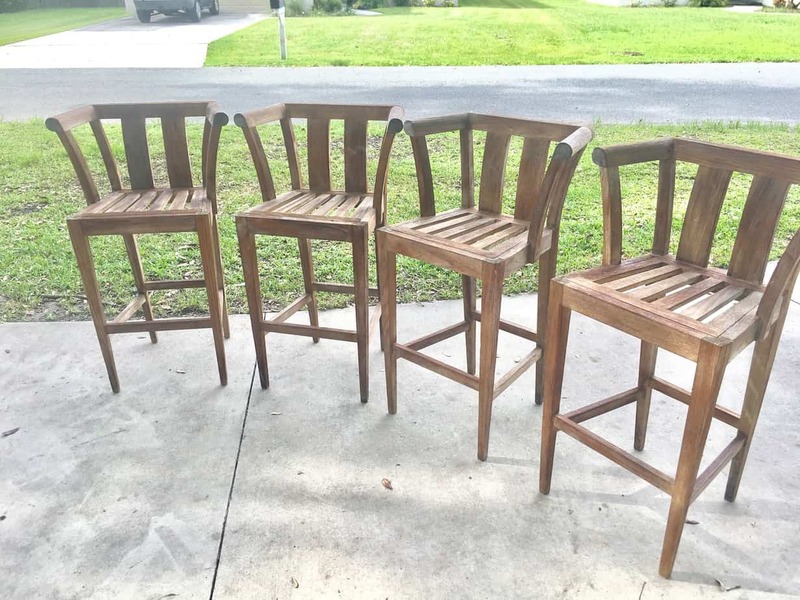 When you first walk up to a piece of teak furniture, it looks like it's going to be light to pick up because it's fairly porous, but that isn't the case. It is very dense and very heavy. Check out this detailed article from the wood database with all the specifications of what make up teak wood. I recently found a piece of furniture on Offer Up that I thought might be teak (a different one than the one pictured above), and when I arrived it was very light and easy to pick up so I knew it wasn't the teak I was looking for. It can be hard to tell in pictures alone, but in person you should be able to tell the difference. I really enjoyed this past flip because it's a lot of fun to see something go from worn out looking to fresh and new with a little elbow grease. 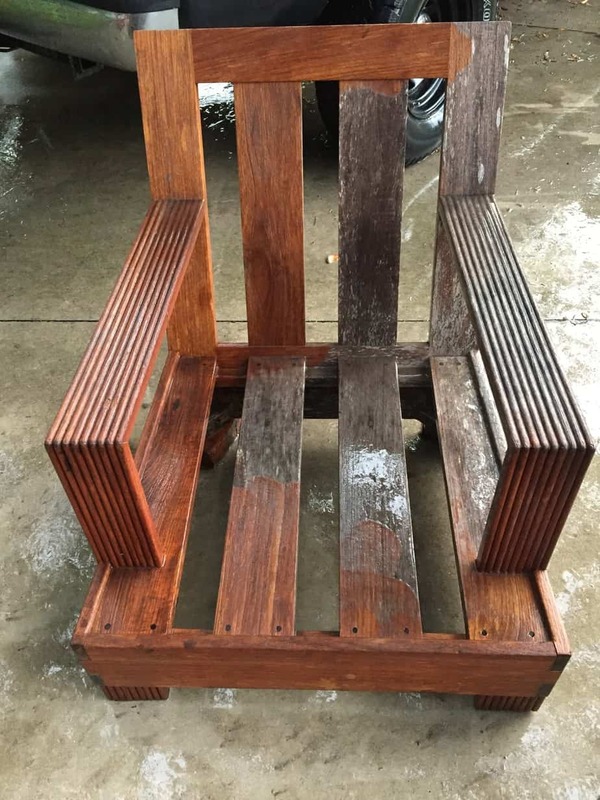 This project didn't take a ton of time, and it's fairly simple to restore teak wood. 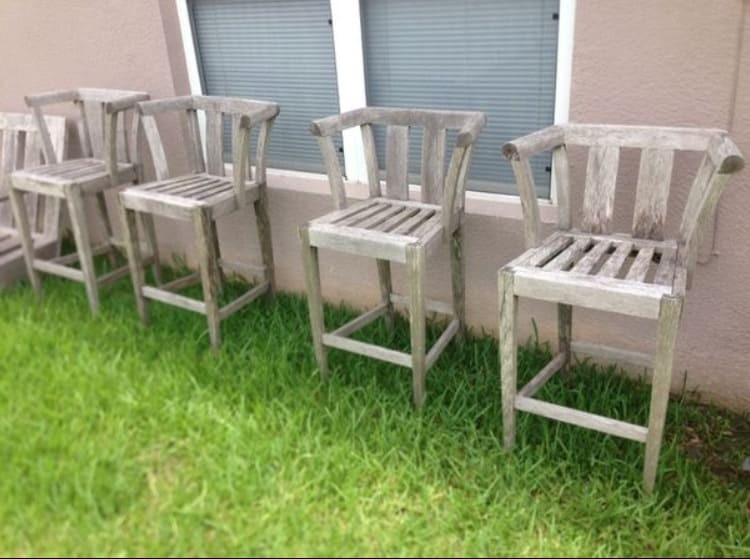 If you find a piece that looks old and faded like these pieces, the first thing you want to do it pressure wash it. This will remove all the mold and grime on the furniture, which will leave you with a nice clean piece of wood. 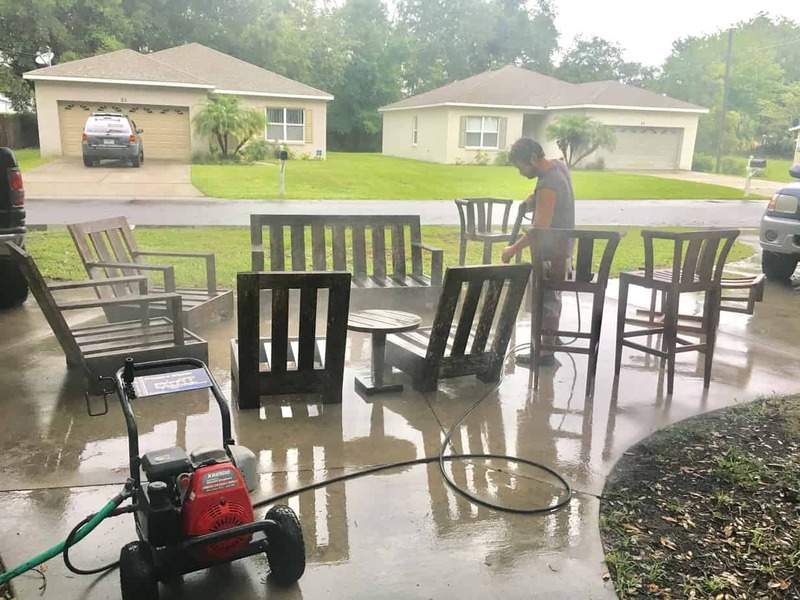 Here is an example of the chair when I was in the middle of pressure washing it. Look at the difference in the wood! You are getting all that old junk off and it's like new underneath it. 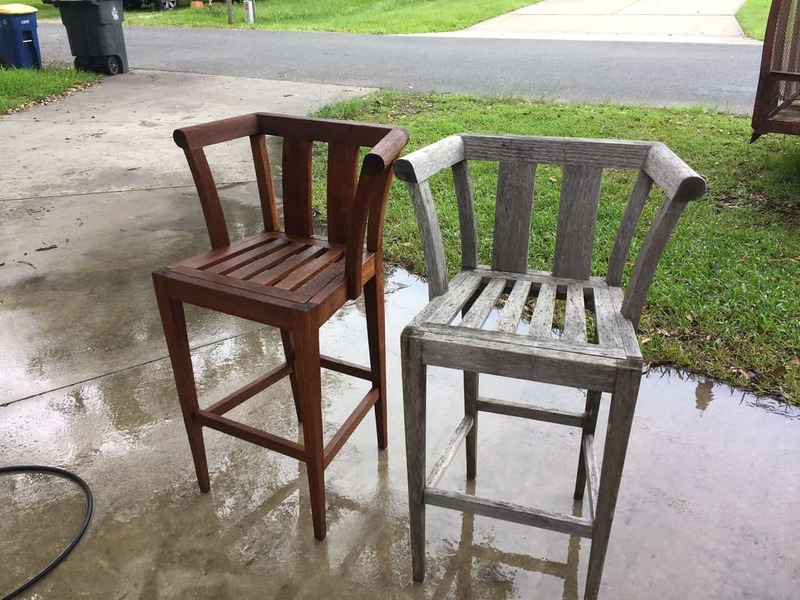 Check out these two bar stools- one is pressure washed and one isn't yet. Just slightly different right?? It's amazing how hardy this wood is. An alternative to pressure washing is to use a teak cleaner and a teak scrubber. If you don't have a pressure washer, or access to one, then this is another option. It will take a little more time and work, but it will clean the mold and grime off too, and leave you with the nice wood to work with. Once your piece is pressure washed/cleaned it's ready for the next step. In the pictures above, it almost looks like the furniture pieces don't even need oil. They look great how they are after the washing. But, they are still wet in the pictures and once they dry they don't have the vibrant color anymore. They are a brown color instead of a grey, just not as deep of a brown as they would be if they were oiled. So we oiled them using teak oil. At first, Melissa bought a stain that was horrible to use. It was so sticky! Stick to the oil, that's all you should really need to liven it up. The teak wood will absorb the oil fairly quickly if it has been sitting for a long time with no care. You may need to use 3-4 coats in some cases. This picture below was after 2 coats of oil, we added one more coat after this one. If you are here because you love flipping furniture, then teak is always a great one to look for. It's an expensive wood because it's so durable. We bought this entire set for $100 from offer up and sold it all for $2,200! (Which is still half of what it's worth). I quoted $400 for shipping and since the buyer lived only 2 hours away, I drove it to him myself for about $100 in gas. So I made another $300 for my time to deliver it. Here is a pic' of me packaging it up to ship out. If you would like to stay updated with our flea market flips and eBay tip updates, drop us your e-mail here. We promise not to overload your inbox. We can't stand that either. 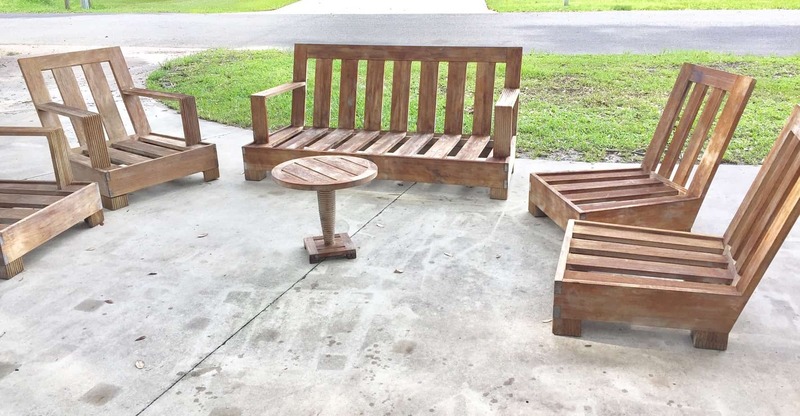 Have you ever taken on a project to restore teak wood? How did it turn out? Did you keep it or resell it? Comment below! What an awesome find and flip! It really is amazing how teak can come back to life with a little cleaning and treatment. It’s too bad more people don’t know about this (but I guess good for you since they didn’t realize how much their old stuff was worth). Loving these posts, Rob. Inspiring me to want to try this kind of thing! I know of course one can small and scale up, but looks like you’ve got a lot of tools at your disposal now. 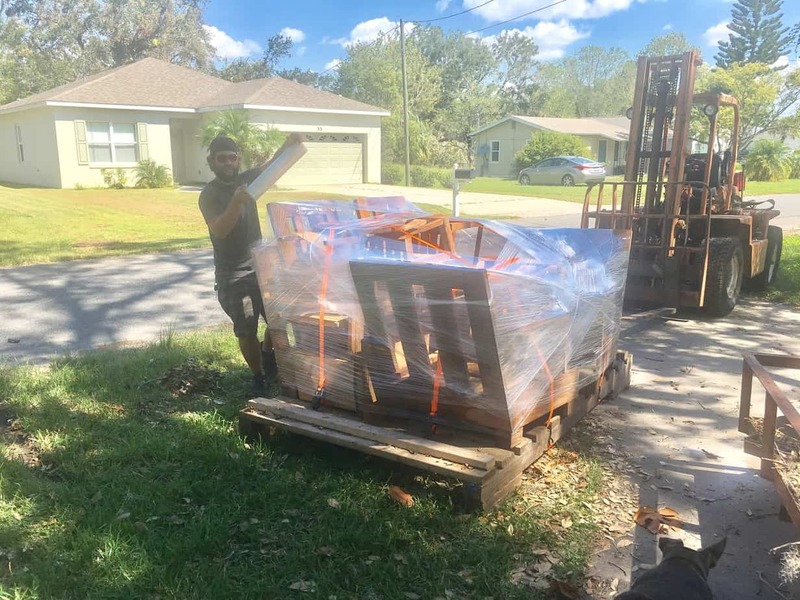 For the shipping part – is that a forklift you have in the background? And do you have a really big truck already, or did you rent a big U-Haul or something? Hey Paul! I do have a forklift and a truck now. But I don’t use the forklift for shipping most things freight. And I definitely didn’t start with these! Just picture buying a nordic track machine and fitting it into a mustang convertible…. that is how I started. haha! When people want top scale up a small 4 x 8 trailer is all you really need for some of the larger things. No need to buy a truck for it when you are starting with large items. I can’t believe the transformation that those pieces of furniture had, I know I’ll be tackling my furniture in the garden to see if I can find any hidden gems. Do you suggest a certain power range for a pressure washer to get these types of results? or will any old pressure washer do, I have one which I use to wash my car, hopefully that’ll do the job! That should probably work! The one we used was 1725 PSI. You don’t want to use too much because it can damage the wood. Hi Filip! Usually a pressure washer will take most of the mold off. Sanding should be ok on spots too. It’s a very course wood so it won’t cause damage to it. That’s pretty awesome. I really love rustic style furniture. Me too! And thank you! Mrs. Picky Pincher recently posted…Feeling Your Tatas Is Frugal! You’re welcome! Happy to help! 🙂 It really is a great wood to find.